As an extensive user of vehicle lighting products on our own equipment, we were always looking for better ideas and better quality products. A few years ago, we discovered LED products with a lifetime warranty and made in the USA. The price point is almost always lower than the big box stores! Having first-hand experience with these amazing products, we decided to become a dealer and started building inventory of several popular light styles. We currently stock Tecniq’s entire line of Dragon and S33/S34 3/4″ bullet marker and accent lighting products. In addition, we have demo displays of Tecniq’s DOT lighting and entire line of interior lighting products. For a demo of these products, feel free to give us a call to arrange a time to stop by our office and check them out! 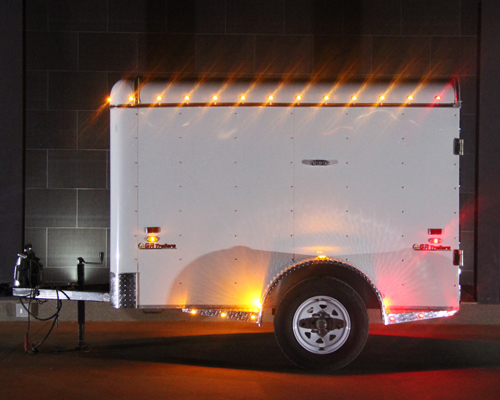 We also offer installation of Tecniq LED lighting products on your vehicle, trailer, RV, fish house, etc. – If you have a trailer that needs upgrading, a fish house that needs sprucing up, or want to make your RV far more energy efficient, we can help you choose a solution, and professionally install your upgrades! The applications for our LED lighting products are limited only by your imagination! Need something not mentioned here, give us a call! As a Tecniq dealer, we can source any of the innovative products they produce, and if we don’t have it, we’ll find it for you! Gallery and online purchasing… Check back again soon as we’re building an online store and product gallery for these exciting products!